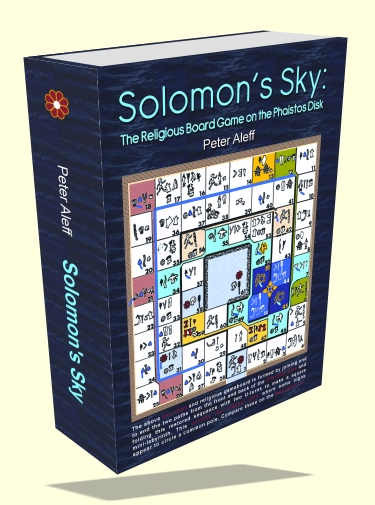 This hidden page is set up as an exclusive favor for readers of Popular Archaeology who liked Victoria Shockley's and my article "The Phaistos Disk: A New Approach" in the December, 2012, issue and want to learn more about the discoveries described in the book "Solomon's Sky". Until December 31, 2012, you can access here for free the same book that will soon be available for sale in various e-book formats and as paperback. The only differences are that in this online version, the endnote reference numbers are not yet in their continuous sequence, and these notes are still on the individual web pages instead of having been moved to the end. Also, the division into "scrolls" is tailored to the loading times of web pages and will be different in the e-books. Moreover, this online version is in full color whereas the printed version will be limited to black and white and some shades of gray. ©1982 to 2015 Peter Aleff. All rights reserved.